Join the Mustang Club of Tampa today and be part of an amazing group of Mustang enthusiasts dedicated to sharing the legacy of the iconic ford vehicle, while helping to provide for the Tampa Bay community. 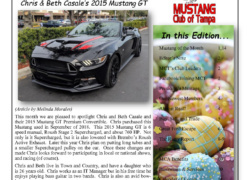 Find out where the Mustang Club of Tampa is going to be next. This area lists shows that we will be taking a part of, as well as shows that we are hosting. You can even look back on shows you may want to reminisce about. Wondering when the next club or board of directors meeting is? Find out the current meeting schedule right here. Mustang Club of Tampa meetings are open to all members or anyone who may be interested in joining the club. 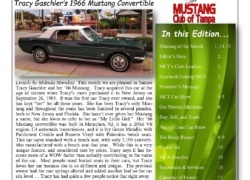 Each month, MCT puts out a newsletter highlighting our members and their cars, as well as tips and articles on all things Mustang. Check out this months newsletter, or view the archives for one you may have missed. View photos of events that we have participated in, as well as members and their Mustangs. If you have photos that you would like to share with us for the website, please contact us and we will get in touch with you for a way to do so. Connect with us on Facebook to share with all we have going on in the social media world. Our page is constantly updated, and has lots of club member interaction. Many of our events and photos are posted on our facebook page as well. 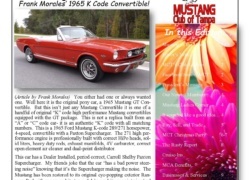 If you are looking for a way to get in touch with the Mustang Club of Tampa, this is the place to go. Simply fill out the contact form provided on the following page, and someone will get back to you as soon as they can.